Weleda is one of those companies that I've heard many great things about but just hadn't gotten around to trying until very recently. This European company, founded in 1921, has a rich history of creating all-natural skincare products that focus on healing, wellness, and balance. In fact, you may have even heard about their infamous Skin Food moisturizer (if you haven't, it's amazing). 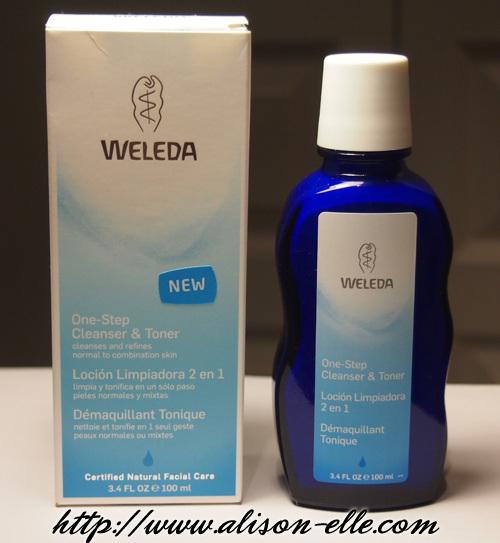 Last month, Weleda released its new One-Step Cleanser & Toner, which I was fortunate enough to be sent for review. This new product aims to simplify your daily routine by combining the deep cleansing action of natural olive oil soap with the toning properties of witch hazel extract. The One-Step Cleanser & Toner comes packaged in a gorgeous blue glass bottle that I was initially afraid of breaking. However, I was relieved to find that the bottle shape makes it easy to hold even with wet hands. Once you remove the cap, the tapered plastic spout ensures less waste, letting out only a few drops at a time. The actual product is of milky consistency that you apply and then rinse off. This cleanser & toner is best suited for normal to combination skin (which I have) and leaves my face feeling refreshed after use. I've been using it for my morning face washes as I don't find it strong enough to remove makeup at the end of the day. If you don't wear much makeup, you could probably use this both morning and night with no problems. Weleda describes the scent as "fresh citrus" derived from pure essential oils. I personally think it smells more like witch hazel, which some may not like but is not necessarily unpleasant. Personally, it actually helps wake me up in the mornings! Conclusion: it's a great product if you're looking for a gentle cleanser made with natural ingredients. In Canada, a 100 mL bottle of Weleda's One-Step Cleanser & Toner retails for $24 and can be found at www.weleda.ca, Whole Foods Market, natural independent health food stores, Planet Organic Market, Nature's Fare, Noah's Natural Foods, and Rexall Pharma Plus stores. i actually need a new toner, i need to try this out! You should! It's gentler than a lot of other toners I've tried. I've been really impressed with their products even though I was only recently introduced to them!